Now, we all know summer is approaching soon and when the weather gets too warm it’s hard to find a summer hijab outfit. Well, I’ll show you guys one of the outfits that I like to wear during summer and it’s my go-to. This summer hijab outfit is perfect for a casual day look or even a night-out with some friends. I mostly tend to wear loose fitting clothes and less layers. 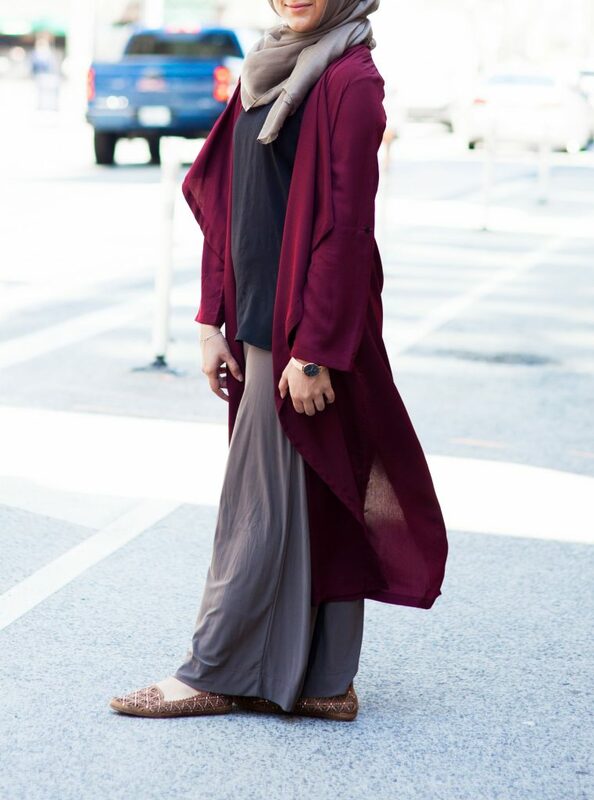 For this outfit I decided to wear wide leg trousers and burgundy drape coat. This drape “coat” is literally so lightweight that you feel like you’re not wearing it but it just brings more definition to the whole outfit and brings it all together. Since the pants were brown, I matched my hijab with the same color. 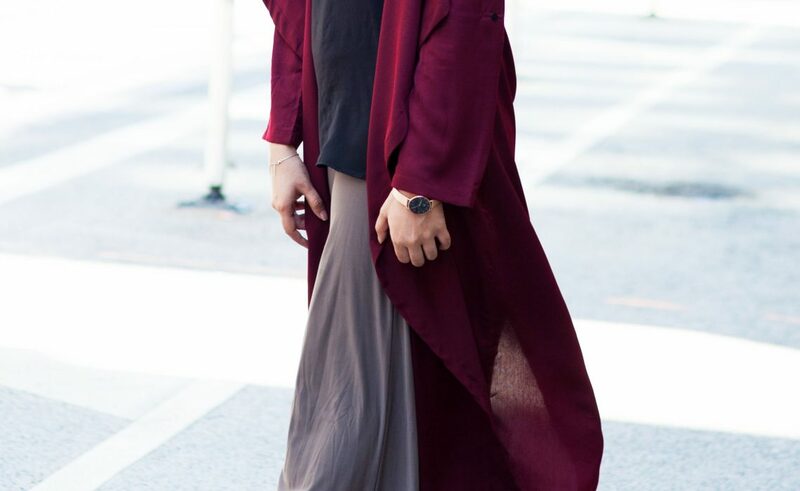 I wore a plain black top and the burgundy drape coat to finish the whole outfit together. The drape coat looks so nice with the outfit MashaAllah! Those coats are popping up everywhere so I got one and can’t wait to style it myself! I love how everything goes together. Looks really chic but comfy for the summer! I always struggle finding and wearing tops modestly. I feel like everything is too tight and short- thanks for the inspiration! Your post helped a lot. Will be trying out these outfits? Assalamualaikum wrwb, I really like all your outfits. I really like the color of ur drape and how ur hijab compliments it and I loved ur previous outfit the mustard yellow one with white bottoms. Kudos on laughing ur website? This whole outift is incredible love how the colours compliment each other and the drape coat is my favourite piece of clothing ever. It looks elegant and trendy from top to bottom?? I dunno from where this kinda combinations comes in your mind?? The supper loving way of your pairing everything together ? As a hijabi you are seriously mine dress icon ? even my family loves your sense ? the modest version of fashion is the perfect example is you just love the way you are..like all the other dresses this one fantabulously gorgeous ??? I really admire your modest outfits from Winter to Summer the coordination is fab! Especially the flowy look you’ve created with a splash of colour from your drape ties the summer look perfectly! I love you’ve colour coordinated the gray, black and burgandy together; they fit together so perfectly! And I love how you emphasized how lightweight all the clothing is, so it makes it easier for hijabs to dress fancy and not be too hot in the summer. Love the colour co-ordination going on. I also love how the outfit looks so lightweight to wear and it’s just perfect for the summer. A light cardigan with a nice top and wide/palazzo pants is my go-to summer outfit!! That or maxi dresses 🙂 I definitely need those pair of pants ? © Copyright 2017 Wardah Mushtaq, All Rights Reserved.